From what I had heard, he didn't trust it. He liked to type it all in his HP12C. I inherited a financial reporting spreadsheet with about 20 tabs. A ton of duplication of numbers right there in the instructions. Step 37: Enter this number in this list of 23 cells in 13 different tabs of the spreadsheet. Step 41: Make sure that the formulas in this list of 49 cells all produce the same number. Heavens to Betsy! I get that we have to present largely the same information to 12 different audiences in slightly different ways, but that is why God invented links!!! I spent about 6 hours one day cleaning it up and decreased the monthly time to complete the workbook from about 3 hours to about 30 minutes. Also pared down the list of things that the checker needed to check drastically, although it was another year or so before the checker changed to a non-Excel-idiot who actually stopped doing the old checklist in favor of the new one. 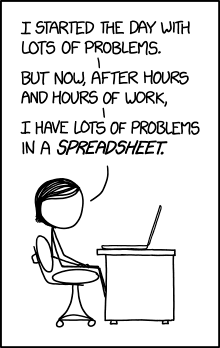 Of course if I was ever out when one of the inputs needed to change, my backup would fork up the spreadsheet again by hard-coding stuff over formulas, usually resulting in errors somewhere in the results. Reading this, I imagine a website called salesoutpost.com, with a thread called, "How to Screw with Your Actuarials"
Made a 'flipbook' style of cartoon using multiple tabs so you could scroll through the tabs showing a stick-person's head fall off and roll away. Favorite beer: You gonna finish that? In the older days, people here uses Excel to check exam result from CAS website.